Joe is a Legend! Not just because he created Motorhead logo or breathtaking artworks for many outstanding albums. 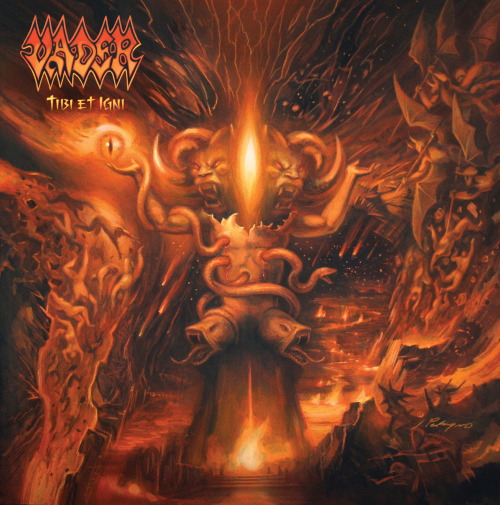 Joe is over all times and his imagination touches the Hell itself….And this is enough reason to ask him for painting ‘a Hellfire’ for Vader’s new music. He accepted it and… made me so proud! They have been on my “get in touch” list for years. Finally we managed it and for a killer album very appropriately titled: Tibi et Igni. Singer/guitarist/keyboard player Kev Bower has something to say about the artwork and its concept: » The artwork for “Curse And Chapter” is once again the result of our collaboration with artist Dan Goldsworthy and photographer Nigel Crane, who we first worked with on the “Human Remains” album cover in 2011. The digipak for this is one of the most complex pieces of CD/DVD packaging ever attempted by Nuclear Blast, and the concept for this was dreamed up by myself and Andy Sneap whilst staggering back from the local pub late one night, after a ‘heavy creativity session’. It was inspired by the rise in spiritualism in England during the 19th century, during which time séances and attempts to communicate with the dead became commonplace – along with the establishment of numerous secret cults and aristocratic organizations who would meet in secret, attempting to raise spirits and reach ‘the other side’. We also wished to explore the phenomenon known as ‘post-mortem photography’. Because photography was very costly at the time, the only time ordinary families could justify the expense was after the subject was already dead. We became gripped by these macabre Victorian images of deceased family members and children being posed alongside their living families, often being supported in a standing position by equally macabre mechanical devices designed specifically for this gruesome purpose. The other major issue with spirit communication is that you never know who (or what) will ‘come through’ – and it was common for malevolent entities to create havoc in the séance room. 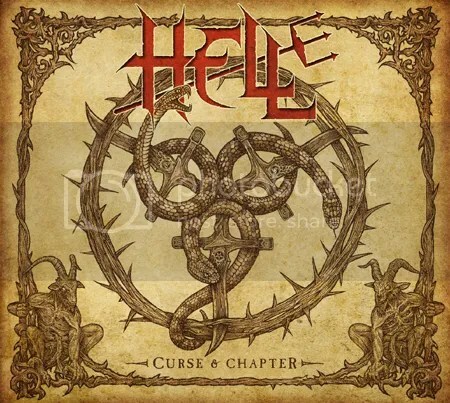 Risen from their own sinister legacy and having disbanded in 1987, Hell were reincarnated only two years ago with the addition of Andy Sneap to guitars and David Bower on vocals, joining original members guitarist and keyboardist Kev Bower, bassist Tony Speakman and drum machine Tim Bowler. Now the British quintet are about to release their follow up to their 2011 release Human Remains which was released via Nuclear Blast. The sophomore offering, titled Curse And Chapter, will also be released via Nuclear Blast on 25th November, later this year. We’ve been working solid on the album for the last couple of months between gigs, although we’ve been demoing to a good standard over the last year or so. This time around the album consists of around 50% old material 50% new. We really see this as a band that’s moving forward rather than a nostalgia trip, obviously there’s a lot of history within the band, but there’s also a whole world of ideas we want to get out. We have this week left tracking, 4 more vocals and bass to get down, 2 more songs of guitar and then mix. I’m super happy with how things are shaping up, it feels more like a band on this record to me than the first, which I guess is just a natural progression of everyone playing together a lot more over the last couple of years. Alongside some of our favourite themes of historical, political and religious persecution, intolerance and prejudice, you will find some good old fashioned myths and legends being invoked and reinterpreted in our own inimitable way. We also have some songs in which the listener will be implicitly invited to solve the clues contained in the lyrics in order to find the meaning of the stories for themselves. Being completely aware that many people interpret things in ways that writers do not expect as a matter of course, it seemed logical to take that idea a little further. It’s a hellish play on words of the English saying chapter and verse, and also a reference to a song lyric in The Age Of Nefarious, the opening track on the record. 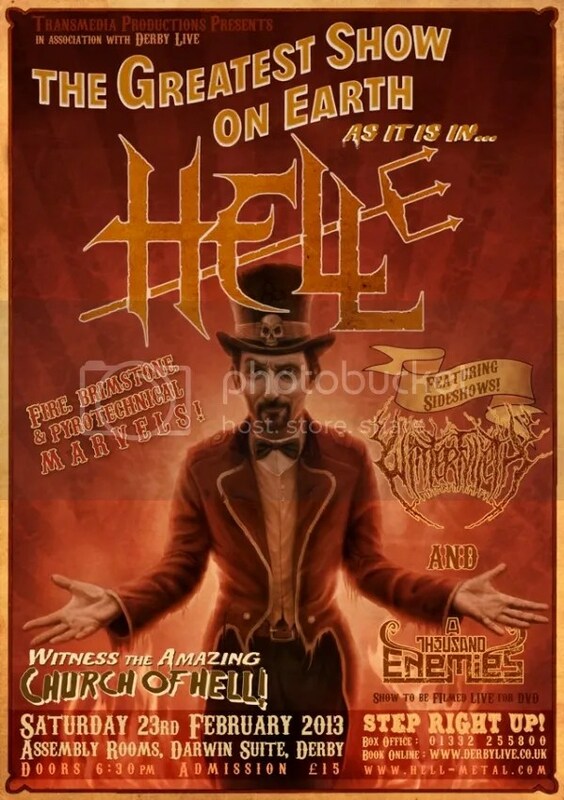 UK metal legends Hell are putting on one hell of a show, to celebrate the start of the recording of album two. This special performance coined as The Greatest Show On Earth, will be filled with “fire, brimstone and pyrotechnical madness”, with support coming from the epic Winterfylleth and A Thousand Enemies. The show will also be filmed live and mixed in 5.1 for a special DVD release, later in 2013. Next year, on February 23rd, the UK will see HELL stage their full ‘Church Of Hell‘ at Derby Assembly Rooms, Darwin Suite. “The first Headline show I ever saw was ‘Iron Maiden’ on ‘The Beast On The Road Tour’ at Derby Assembly Rooms. It used to be a regular Midlands show on every bands touring schedule when they passed through the UK and anyone frequenting the first couple of indoor Bloodstock festivals will know how great a venue for metal this is. We can’t wait to bring a full on, unashamedly over the top metal show back to the Assembly Rooms on Feb 23rd 2013“. Cited as a huge indirect influence, and as one of the true founding fathers of occult metal, Hell formed in 1982 from the carcasses of UK metal bands Race Against Time and Paralex, whose White Lightning EP was listed by Metallica as a favourite, and which was subsequently included on the Lars Ulrich, Geoff Barton ‘NWOBHM ’79 Revisited’ sampler album. Despite over five years of constant touring, the band were cruelly overlooked by the ’80’s music press, who just didn’t get it. Hell were too different, too extreme, too musically intelligent and far too thought-provoking for all but the most enlightened to understand them. A teenage Andy Sneap was a permanent fixture on the front row of almost every show Hell played and went on to form Sabbat and become a renowned metal producer. Upon meeting again, the remaining members of Hell – Kev Bower (guitar/keys), Tony Speakman (bass) and Tim Bowler (drums) talked with Andy about re-recording the old material to release in conjunction with the old demos. With Sneap replacing Halliday on guitar and David Bower on vocals, the band recorded 10 Hell classics from the 80’s that became their 2011 debut ‘Human Remains’.